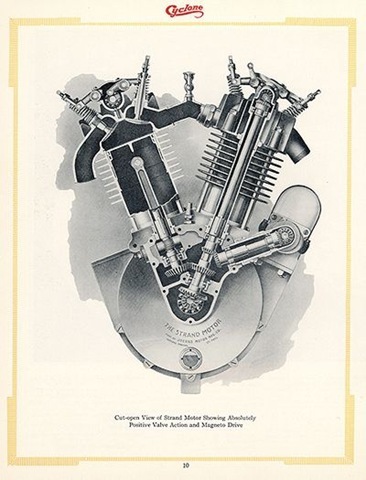 In the earlier articles on early combustion engines, we looked at automatic inlet valves, IOE and sidevalves, and combined rockers. This time I’d like to share some images regarding overhead camshafts (OHC). Louis Chevrolet (yes THAT Chevrolet) patented a motor design in 1917 that shows OHC valve actuation clearly. In fact, this motor is a DOHC, 4 valve per cylinder motor; Much like what you have in your modern Honda or BMW car. 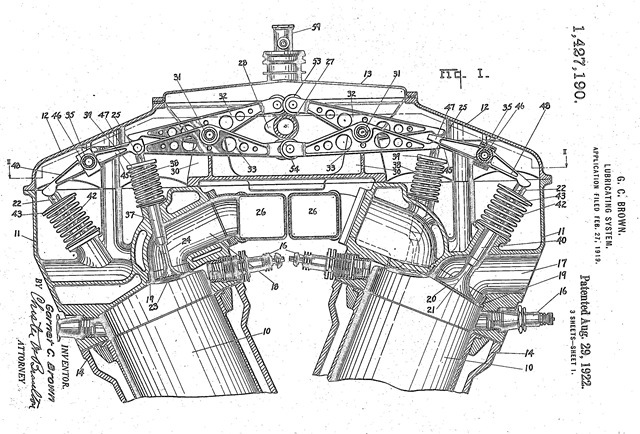 The exhaust valves are shown in the top view, on the right side, numbered #20 and #21, or #35 in the bottom view. (we can tell they are exhaust valves by the Ex. Lifter #33). The camshaft is shown in section as #29, which has a simple follower #31. The tappet is #30, which pushes the valve open, fighting the force of the spring #34. Interestingly, there appears to be no way to adjust the tappet clearance… As the valve tip and spring were exposed, possibly a shim or cap could have been fitted to the valve tip under the tappet. A few other interesting things can be seen in that lower left image, including the empty pockets in the cross section above and below the valve pockets. These are the water jackets, of course they were common on cars of that era. But there is no joint shown between the cylinder block and the head, which would typically be horizontal, near the top of the bore (just below the valve heads). No lubrication details are shown, but that cam and follower would have worn fairly quickly. The cam diameter is pretty small, which helps to decrease the rubbing speed on the follower, but a constant supply of pressure-fed oil would go a long way to decrease wear. 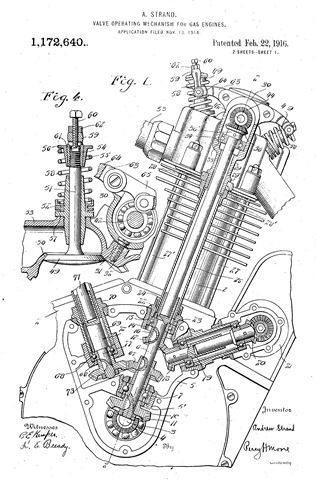 The next patent is titled Lubricating System, but it shows us much more than a simple oil pump and passageways! 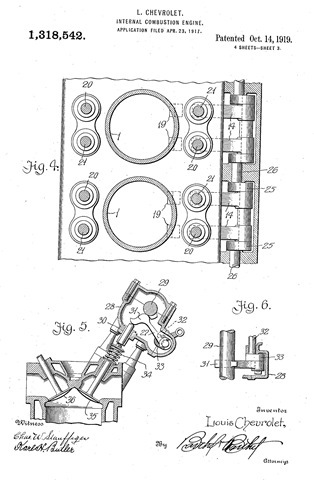 Awarded to Garnet Brown in 1922, this patent shows a novel approach to OHC actuation. At first glance, we see a cam #28, centrally mounted with some rather long cam followers. But upon further examination, you will see that this one camshaft operates the inlet and exhaust valves for BOTH cylinders of a V engine. We’ll start with the inlet, shown on the left #24. The cam lifts a roller follower #32, which directly actuates the inlet valve. The inlet plenum is #26, valve seat is #19. 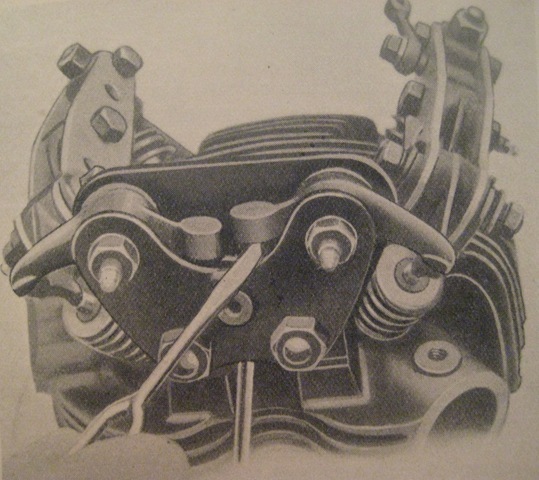 To operate the exhaust valves, the cam depresses rocker #33, which lifts rocker 48, both shown in the right side of the view. Fans of the Rudge radial 4 valve motors of the 1930s will immediately glean what is happening with those rockers. While Rudge used the same idea to turn the mechanical motion into a different plane than the primary rockers, the idea is the same. Mr. Brown had some good ideas with this patent, including dual spark plugs per cylinder #16, and roller bearings on all rockers #46. The roller cam followers #53 help to decrease wear. He also wisely shared the shafts for the inlet and ex rockers #31, used water cooling and enclosed the valve gear to keep oil in and dust out. But the big holes in the rockers give away one of the downsides to this arrangement. Mass. These long rockers and secondary rockers have a lot of mass that must be accelerated to lift the valve, stopped, and then accelerated in the other direction to close the valve. Since one of the biggest advantages of using OHC is that the mass of the valve train is minimized, this layout must not have been ideal. Drilling those holes was a good start, but those long secondary rockers look like they must have flexed a bit at high rpms. 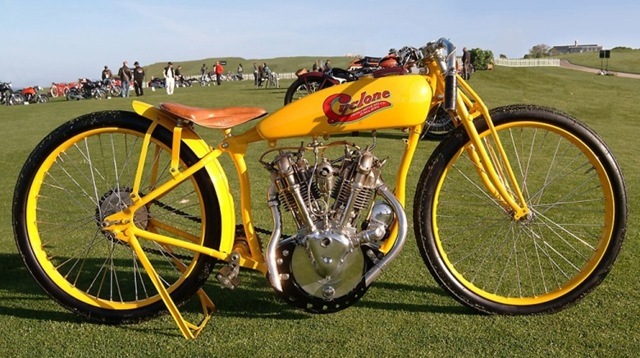 Next up is the OHC V twin motor patented by Andrew Strand, manufactured by Joerns Mfg and used by Cyclone motorcycles for a few years in the mid-teens. The cam has roller followers, seen in the view on the left. Rockers #65 take the motion out to the valves #49, but via an interesting detour. 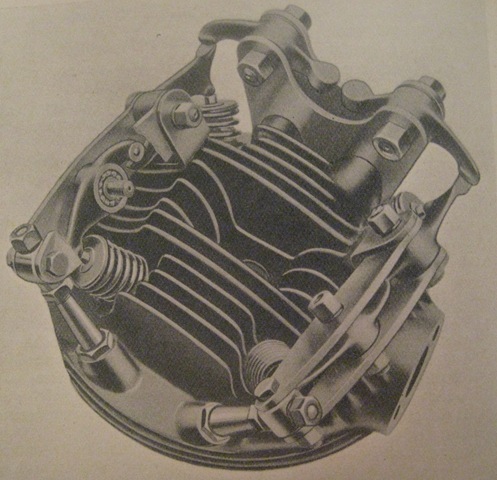 Strand used stirrups #59 to give the valve operating linkage an extra degree of freedom. As the stirrups were free to rotate on their pivots, they eliminated the side load on the valves, which helped to decrease side loads and increase valve guide life. To take the motion from that main vertical shaft back to the rear cylinder, and also to the magneto, several more bevel gears (and bearings!) were used, #67 #73 #17 #18 #68, etc. In all, 12 bevel gears were used, and at least twelve ball bearings just for the timing and ignition. Add in the main bearings and big end bearings, significant machining and assembly efforts, and we can start to see that the cost of this motor was much higher than what the competition was selling. We should not be surprised the Strand used quality SKF bearings, sourcing them from Sweden to his Minnesota factory, as the numerous immigrants from Sweden to MN must have brought a local connection. A good question is “how did it all work out?” Well, the motors ran very well, and very strong. While racing a Cyclone in 1914 J.A. McNeil set a new record at 111 mph, besting the Excelsior of Lee Hummiston at 100mph. The quality of the workmanship was very high in most regards, as the motors were machined to very high accuracy. In fact, they claimed that no shims were used to set preload of the various bevel gears, requiring a tolerance stack up of the machined parts to be better than .001” accuracy. I’ve designed and built a fair number of machined parts and systems, and I’m a bit doubtful of that claim. But since I have never opened up one of these motors to verify it, I’ll have to ask a friend this summer who has one if he knows the truth. It certainly could have been done, but not quickly or cheaply. Ultimately, the motors and the bikes were not as reliable as more conventional designs. Some races were lost while Cyclones were in the lead, due to mundane issues like cracked fuel tanks or broken chains, but also due to exhaust valve and piston breakages. Racing wins help to sell street bikes, but not nearly enough bikes were sold to keep up with the high costs of R&D and racing efforts. In just a few years, these motors were gone, and it took some time before British and European factories developed these ideas further (see Velocette KSS/KTT, Norton International/Manx, etc). Other than a few subsequent experiments by Reading Standard and Excelsior, the American manufacturers stayed with sidevalves, IOE or OHV.